The 2016 Building Energy Efficiency Standards are scheduled to become effective on Jan. 1, 2017. One area of the 2016 standards that has received a lot of attention is the new hot water pipe insulation requirements. These new standards apply to new homes constructed after Jan. 1, as well as to any homes that are remodeled after that date. There are overlapping plumbing requirements for residential hot water pipes in the California Plumbing Code and the 2016 Energy Standards, as the latest issue of the California Energy Commission’s Blueprint publication notes. According to the California Plumbing Code, Section 1.1.7.3, whenever there are conflicts between the Plumbing Code and the Energy Standards, the more restrictive requirement must be followed. 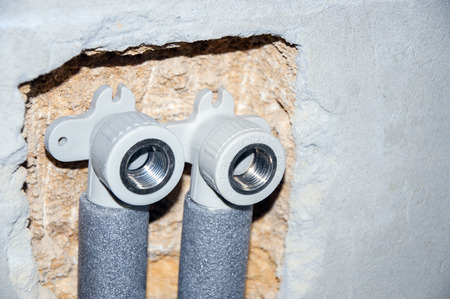 The 2016 Plumbing Code, Section 609.11, requires domestic hot water pipes to be insulated. It also specifies that pipe insulation must be at least the thickness of the pipe diameter, while pipes larger than two inches must have at least two inches of pipe insulation. However, Table 120.3-A of the 2016 Building Energy Efficiency Standards requires that water piping less than one inch in diameter shall have one-inch thickness of insulation and pipes that are one inch to less than 1.5 inches in diameter shall have 1.5-inch thickness insulation when insulation is required. Since this requirement is more restrictive than the 2016 Plumbing Code, it governs insulation rules for pipes of this size. The California Energy Commission’s Online Resource Center provides access to compliance documents and public domain compliance software to make the compliance process easier. Rick’s Energy Solutions can help you prepare and submit the required California Title 24 energy conservation documents for your new home or remodeling project. We are among the top green building consulting groups in the state and can assist you with your energy efficiency improvements. Contact us by calling 707-578-5380 today and learn how we can help you make your home more energy efficient and compliant with the latest energy standards.